@Armadeus wrote: An analysis of TFA that is mercifully free of 'fan-nish' postulations and harangues. What a great and well written piece! I think the reason I enjoyed TFA myself is because Kylo, Rey, Finn and Poe are not Vader, Leia, Luke and Han - rather than ripping off a quartet of truly original characters they instead creating four new and equally engaging protagonists. I'm a huge fan of the originals but I love the 'newbies' just as much. I'm a comic book nut,but I stopped reading 'X Men' when they killed off Wolverine and replaced him a teenage girl who was a clone with identical powers. Not because I don't like strong females - I do as a woman - but because Wolverine was a truly original character and this 'new' Wolverine just seems a pale copy, at least to me. I'm glad JJ chose to go with different character types,because there'll never be another Han Solo. Just as there'll never be another Kylo Ren. There was a thread on here awhile back about Kylo being JJ's avatar vis the legacy of the movies and fandoms to want to identify with and preserve the past. Versus the newer fans (like this place) being rooted in Rey and Finn. Which is kind of the larger metaphor of balancing the Force and likely how both of the factions shown in the ST (First Order and NR) are imperfect vehicles for moving into the future. Also, ha enough people on here have joked how things bode well in certain directions if Kylo is his avatar because we know that JJ (and Kasdan) looooooves Rey. And a character named after the lead actor's son who's an avatar for the producer, not likely he'll stay bad and just get killed off. Basically everyone mentioned reasons why is Kylo so compelling. It's because he's flawed. That is something I appreciate in villains and heroes, the growth into a bad***, fiercy warrior. We got Anakin and then Vader. Ben and Kylo, wish we can see some flashbacks to younger Ben. Kylo is troubled, vulnerable, interesting, passionate and compilcated young man. His screen presence is immense. Not quite Darth Vader or Maul but certainly a very good one. We see all aspects of him from outburts, cool stuff, into snarky comments. The rise of the villain as JJ called it. We had Rey and Kylo is our villain that will grow even more. But it's not typical generic one dimensional villain. This is one is emotional, with story behind him and purpose. Ben Solo is the other part of him. Let's hope Rian will do a very good job like Jj did in TFA movie. I think Kylo - and also Rey- is compelling because he's so human. This isn't a 'monster in a mask', this is a young man who's struggling with so many emotional issues it's tearing him apart. Hatred and love for the parents who failed him, a desperate need to please the despot that became a substitute for them while knowing he'll never give him the sense of belonging he craves. He's a broken child trying to be a ruthless man. Both Rey and Kylo have the character traits of kids who had to grow up much too fast. They're both mature and yet still childlike. "Kylo Ren from The Force Awakens is heavily implied to have one on Rey as he inexplicably captures her to acquire the information he needs instead of BB-8. He carries her bridal style, watches her sleep, and shows more compassion for her than anyone else. Even Snoke picks up on it in the novelization." Ah, thanks for bringing this to my attention! I checked the page history and someone reinstated the paragraph after my post went up (potentially because of it). Kylo is compelling to me because I feel like I can connect to him. He feels like the most fleshed out character to me. He's afforded the ability to express himself and a lot of the emotions he feels are things that everyone goes through. There's a vulnerability about him that really pulls on me and I can understand where he comes from. There's also a part of me that's compelled to him for nostalgia reasons. He's Han and Leia's son, how am I NOT going to feel some inkling of hope when it comes to his character? The Force Awakens’ big emotional beats stem from Ren’s estrangement from his parents, revealed to be Han Solo and Leia in the film’s “Luke, I am your father!” moment. All this evil, we discover, might boil down to daddy issues. That injects some psychological complexity into the franchise, but it also paints Ren as an unusual villain. He wants so badly to be taken seriously, to be feared like the old tyrants of the Empire, but as soon as that desire becomes clear to the audience, it defeats itself. Ren is strong, but he has a pitiful edge, and Driver teases it out. But they were there own movies, guys. There own. THERE own. Your not wrong (too bad there's no eyeroll emoji on here). Check out youtube - they're unbelievable there,but the good news is there are quite a few positives as well. 2) There/their, cousin to your/you're frequently seen used by "that guy who argues a stupid point to death on other peoples' Facebook posts." 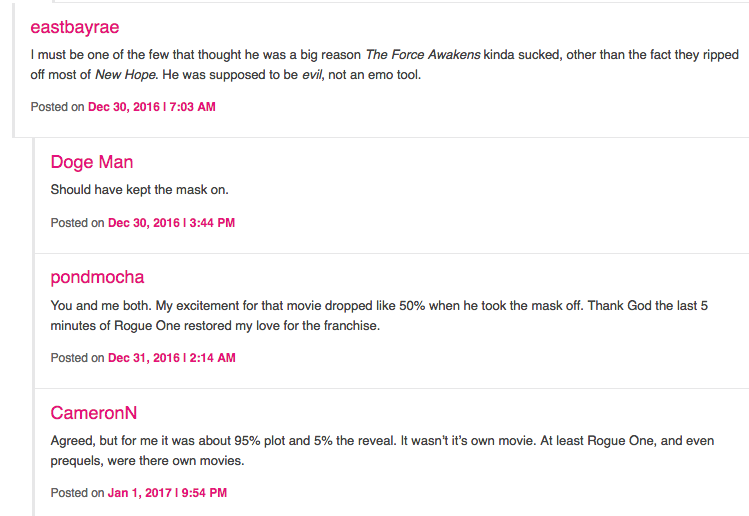 3) Rogue One is the better movie because Vader f**ks s**t up in the last five minutes! Fizz - now I know how to use the eyeroll for future reference! Honestly these type of comments, I guess now I understand how the people I know who work in the restaurant industry feel about Yelp. Everybody thinks that they're (their?) an expert. He was supposed to be evil? Where did they hear that? Was there an announcement from Lucasfilm? No one involved in the crafting of the character - Not Abrams, not Kennedy, not Kasdan - have ever called Kylo evil. 'Should have kept his mask on?' I thought they were complaining that it was too much like A New Hope? 'Last five minutes of Rogue One?' I don't even know where to begin with that one. Even if the last five minutes of RO carry echoes of the space battle in ROTJ? Thought they wanted the films to 'be their own movies'? What do they want, Michael Bay to start directing Star Wars movies? They make me laugh for the most until they stop insulting Kylo and start insulting Adam; he's had enough nasty remarks made about his looks. People who not only dislike Kylo Ren but are fervently, gleefully wishing for his death concern me a little. Like, are you okay there, guys? Do you need to talk? Need a hug? What’s going on? EDIT: There was one "reviewer" (and I use that term broadly) who introduced Driver as 'everyone's favourite psychopath' in reference to his role as Kylo. I'd brush up on my psychiatric terminology if I were them. Kylo Ren is MANY things... a psychopath is not one of them. Heck, Vader comes closer to the term than Kylo and everyone LOVES Vader. @Armadeus - I had about zero interest in SW fan websites prior to just wondering "Okay is that what I thought it was?" But just from an initial introduction to the usual places and seeing the typical "true" fan response to the character, my reaction has been to wonder what those people are like on jury duty. Also ha, yes the psychopath diagnosis. I've also seen people refer to him as a sociopath and having had to deal with actual sociopaths in my life (unfortunately), that's also a ridiculous comparison. He's a nutter for sure, but the whole point is that the expectations and self imposed pressure to live up to a family of icons has driven somebody who otherwise would probably be an introverted, nerdy kid around the bend. It's because of Han Solo. I felt the same to be honest - I'm a HUGE fan of Han Solo - until I saw the film. And saw Kylo. I expected a patricidal maniac. I found a mentally ill kid. And as a mentally ill person, I empathised with him. Have done ever since. I love the OC, but crazy as it sounds I love that they messed up. It's in keeping with their characters as originally created - not perfect, which is why I love them. I have read some otherwise wonderful fanfiction which has spoiled itself for me by depicting the OC as 'saints'. Yes, maybe Kylo has to be forgiven ....but I really think his family should be as well. Kylo made some bad choices,but his family failed him. You don't send your kid away when they need you. I am puzzled by the Fanboys, they don't want rehash of the OT but they are complaining about everything new that was introduced in the ST. I just don't think they know what they want. Yeah I'm always puzzled by the expectation that as a fan, especially as somebody who loved the OT as a child, I'm supposed to feel a certain way. Which I absolutely don't at all. Han was my favorite too, but it says a lot that this is something the actor who played him lobbyed for and wanted. As a way of making this character sacrifice himself in a significant way. Also says something that he made the (brilliant) suggestion for naming the character Ben, not just after Obi-Wan, but his oldest son. You don't go around suggesting that for a character who's meant to be an irredeemable evil. Then again, if I'm completely honest, the love and respect I have for LF movies is almost entirely based on the writing done for them by Lawrence Kasdan. And it's his original idea, which like @motherofpearl1, I find far more true and inspiring because nobody has a happily ever after. People continue to deal with challenges throughout their lives, that seems like a big point of Leia in the TFA (and why I suspect a large part of her character arc in the ST would be informed by Debbie Reynold's real life example). I didn't know it was Harrison's idea to name Ben after his son- that puts the whole thing into a different light! @motherofpearl1 - and the scene between the two of them was written by Lawrence Kasdan and his son. So tell me between the naming in honor of one son and the dialogue/scene being co-written with another son, how am I supposed to write off this character as somebody whose purpose is to be pure unrepentant evil? As for those who refuse to accept this - get over it. People like that also seem to forget that, within the context of the Star Wars universe, the dark side of the Force (and the conflict between light and dark) isn't some figment of Kylo's imagination or some excuse he's conjured up to justify whatever course he's chosen. In Star Wars, the corrupting influence of the DS is something very real, something very attractive, something very insidious, and very pervasive (man, that's a lot of adjectives). Some - owing to their circumstances - just find it harder to resist than others. Basically, I believe Kylo has recognised the galaxy is messed up and he's looking for a quick fix.